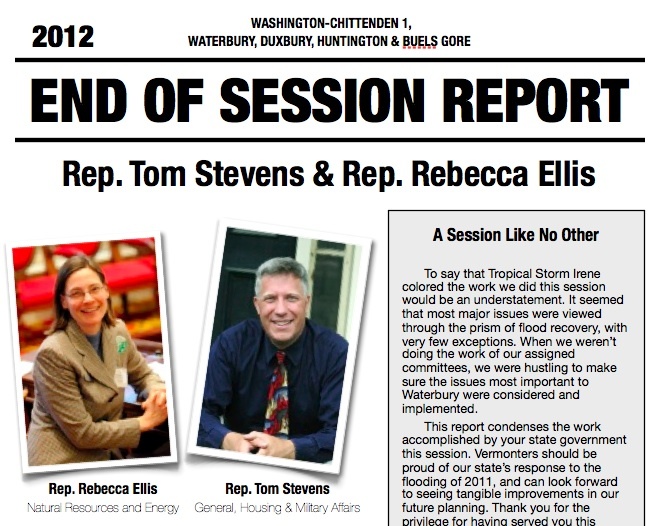 Here’s Our 2012 End of Session Report! You can find the text version of our End of Session Report here. Better yet, here’s a PDF version of it! It was quite a year in our district, and we thank you for your support, your kind words and for sharing your fears and worries as we worked toward getting a commitment from the state to return a substantial number of state workers to the State Complex in Waterbury. The session was more than just flood recovery, of course, and our report covers some of the larger issues. Please feel free to read it and share your thoughts about what we did and what remains to be done. If there is an issue important to you that we did not cover, please contact us and we’ll fill you in. Filed under Bolton, Buels Gore, Duxbury, Huntington, Legislation, News, Redistricting, Washington-Chittenden, Waterbury.